As I had hoped, I was able to get in a few pictures this afternoon. But as it turned out, they're not very good pictures. Sorry about that. Anyhow, this is, more or less, what the square we're digging looks like now. The problem is that in this light, it's not entirely clear that there's something near a two meter drop about three quarter of the way through the shot. When details like that aren't apparent, I wouldn't expect somewhat more fine details to come through. The picture is taken looking north, and the bit close to the edge of the square on the south is missing. But that's more or less what we dug today, and what I'm basing my plans for tomorrow on. The red line should mark the edge of my square. (Triangle would be a more technically accurate, but I'm calling it a square because that's what people excavate. Also, it is a square, but most of it is empty air, having been dug by Garstang and not filled in again.) The area with the red one in it marks the area that doesn't seem to have been disturbed, and which I expect to find good, stratified archaeology. The plan is to chase a Crusader pit there tomorrow, but if I can't get the edge between this area and the next, finding that pit isn't in the realm of possible. The blue line shows the edge of an area of soft dirt, which I think is related to the wall put in by Garstang -- a sort of foundation trench. We'll take a bit of that out tomorrow, and we'll see if I can find something to show that I'm right. The little sort of brown-taupe line is somewhere I'm not sure about -- 3 is either material similar to 1 or to 2. One of the things that might help tell us is the feature that the orange line encloses, and which is marked with a 5. That marks the edge of the area marked 1, and if we find it, we know that the line. If it peters out, the problem becomes more complicated. 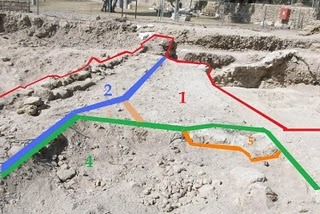 The bit in green, marked 4, is what we've excavated today. It's got a mix of different types of fill, and I'm not quite ready to call it a 20th century layer. But I'm not certain what it is, if it isn't that. I assume that'll get refined, as we get further down. To get back to the story of the sherd, from the previous post. After the day's digging is done, the pottery buckets are taken back to the pottery compound -- the excavation's base camp, more or less, where the initial post-excavation processing of finds takes place. There, the buckets are filled with water, and the pottery is left to sit. It's early days, yet, so the sherds only get to sit in water from the end of the excavating day, 1:00, until pottery washing, which starts at 4:00. I was a bit busy today, so I didn't start taking pictures until after the pottery washing was done. So the sherd I took a picture of earlier isn't actually in those buckets; it was in a bucket similar to those buckets. After the sherds are washed, they're put into fruit crates, and left to dry in the sun. Wet pottery looks a bit different than dry pottery, and if you put pottery away wet, you get bags full of water. And while I didn't get a shot of the sherd in the bucket of water, it is in that fruit crate; it's the green one near the middle, with the incised decoration that makes it look a bit like a palm leaf. In an ideal world, the pottery will be looked at the day after it's washed, but we've been known to get a few days behind, when the excavation season is in full swing. So, the hope is that we'll see that sherd again tomorrow; if that doesn't happen, it'll be the day after. And I think I'll leave it at that, for today.